As this was written but not typed yesterday (the 17th), I'll be referring to everything as in present tense. The 17th of February. just another Friday in Belgrade, Serbia. Another day on the road without a place to call my own. Pursuing my dreams despite insurmountable odds. But just another Friday nevertheless. I've been in Serbia for some time now and this past week has been one of the... most diverse? Activity-wise. So let's get right to the happenings of my past 604,800 seconds. If you haven't been keeping up, refer HERE for the back story. I'll summarize where we left off for anyone short on time. Earlier in the week, I had bought a ticket to go to the club "Drugstore" with some friends. Instead, we rode the metro and walked around Zemun (a nearby part of the city that also considers itself a separate state - ??). All while having a beer in hand because this is Serbia and that's completely normal. One beer led to another and with each additional beverage, a new location. Eventually, we ended up in a bar where we drank a liter or so each and then headed back to the hostel (via bus for anyone worried about drunk driving). Here, you can probably guess that we had another beer or two and at that point, I just wasn't in the mood for a club. So I handed my ticket off to be sold at the door and went to sleep. And THAT is where we left off previously. I had managed to stumble my way to the sink for water throughout the night, so any traces of my potential hangover were all but gone. Which was fantastic as Tom, Tristan, and Abbott were all on their way out the door with some good Serbian cuisine in mind. I just needed a moment to get dressed and I would meet them there. In reality, the first Kafana was closed so they would return before I even left the hostel. Soon after brushing my teeth and getting dressed, we all left en route to another place hidden WAY BACK in an alleyway. A place that supposedly has absolutely amazing food though very little capability of speaking/understanding English. Sure enough, their English speaking skills were all but nonexistent and their food was as previously mentioned, amazing. After a brief intro asking if we would like some rakija (brandy of sorts for you newbies) to start the meal followed by several minutes of google-translate and piecing together the small amount of Serbian language that Tom and I know, we finally worked out that we wanted some sort of stew and bread for starters. The rest could be decided later, after all. The meal that actually followed was beyond anything that I could have imagined. The man (who with his short stature and kind face dressed in what you would expect at an expensive resort restaurant; a dress shirt and pants with a black bowtie) brought out a large bowl of Mućkalica accompanied by Kajmak (a cheese of sorts) and a large round loaf of freshly baked bread. He then proceeded to pour the stew into our individual bowls and present them to us. It was salty and savory with a hint of spice melded with Kajmak in a delicious harmony. The best part was that when the solids were gone, you used the bread (which has a crisp crust but soft and warm inside) as a sponge to soak up the juices and wipe the bowl clean. I could have eaten several bowls without any regrets if I'm being completely honest. Following the stew, we weren't exactly sure what to expect. We hadn't REALLY spoken to the waiter very much and he had mentioned "3 piece" prior to serving us. Alas, nothing was planned to follow. So we asked what our options for dessert were. The answer? Baklava. Back home, I was never much of a fan of Baklava. It was always too sweet for my taste and hurt my teeth. What the man brought out was more similar in taste to a nut-roll that my mom makes, but in a much smaller form. He only brought one small plate of five 3-4" cylinders stacked like Linkin Logs. With four of us at the table... Meaning that the remaining one would have to be split or given to one lucky recipient. Rather than making this choice, we asked for 3 more (thinking 3 more pieces) and were brought 3 more plates of 5. AT 16 total pieces, this was now divisible by 4 and as the first pieces were so delicious, we didn't object. In the end, it was a great decision and I'll happily go back there again. Did I mention that there was an older gentleman strumming a guitar and singing while we ate? The place was a portal into a more simple, yet delicious and relaxing time. The rest of the day was spent helping them (the Aussies) attempt to plan a snowboarding trip around the Balkans. It wasn't super successful as they were running on little sleep and a full stomach, but the effort was put forth. The day ended with a small party at Branko, the hostel owner's, place. The next day, Tom and his friends departed before I awoke. I spent the rest of my week a bit differently than is normal. Studying anatomy and working on digital painting. It's something that I've practiced heavily on-and-off for quite some time now and I felt like I was getting a bit... rusty? 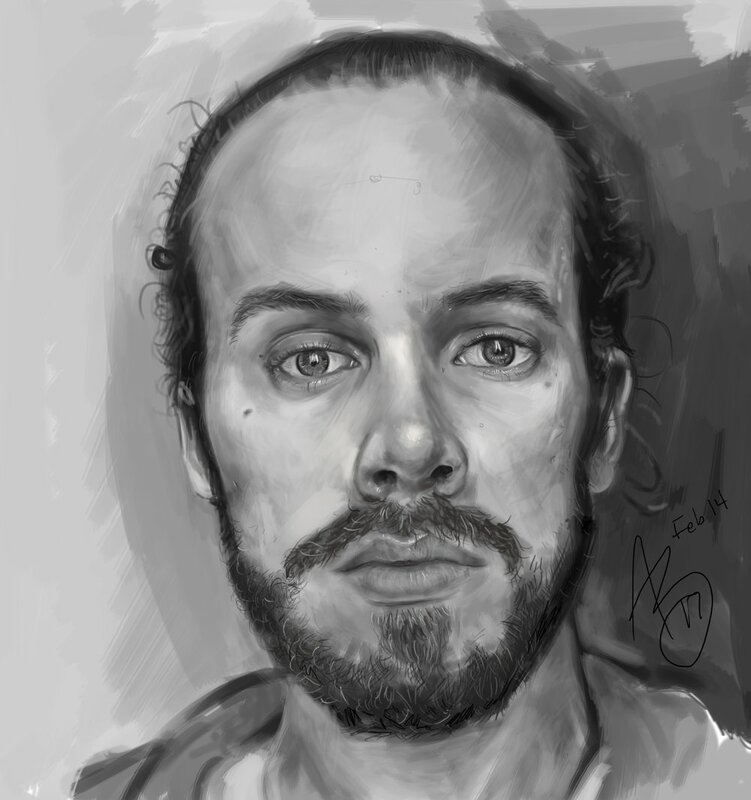 That said, after 2 days of studying and practicing, plus another 2 days of drawing actual portraits, I feel like I've not only caught up to my former skill level but surpassed it. Shading, color, and details seem to come easier now, as do getting the proportions correct earlier on in the process. The first was a self-portrait followed by a portrait in color of a fellow volunteer trailed by a revised portrait that I had started months ago. I'll post the images below for anyone curious. This said, if anyone would like a .pdf of their own portrait, I'm doing free drawings for a limited time as a way of practicing and giving back to those who support me. I just ask that the photos used as references are high-quality. Otherwise, I cannot focus on details and thus I'm not practicing as is the whole point. Moving on. My illustrious illustration career. I went to another hostel on Wednesday as a trial run for more wall art. Their walls are yellowish-orange and we wanted to see what I could do with them. If anything at all. The test drawing is shown below. In addition, I also finally snagged a job illustrating a guide book to natural farming. A small step, but one in the right direction. Branko also noticed that besides strange chalk drawings and signs, I have the ability to draw a wide range of subject matter. As a reaction, he said that he wants to help promote me. To use the hostel as a gallery and even use the facility to have an exhibition come spring/summer time. Oh, and I'm starting large paintings/drawings in the rooms of the hostel which will be situated above the beds. One of which is a painting of Dali, the pug, with a crown in a very Notorious BIG manner (image below). This week was without a doubt the best I've had art-wise in some time. I'm still unsure as to whether or not this will become a regular thing. However, I took Fritz on a long walk in a direction that I've previously never been and decided to grab my camera just in case I saw anything. It ended up being rather interesting and I think that I may start a photo series of it. Fritz in the foreground, something in the background? I'm still mulling it around in my head, but for now, I love the concept.